CHARLESTON, S.C. - The Charleston RiverDogs will host their 16th annual 5K Race presented by Fleet Feet Sports, on Saturday, May 18. 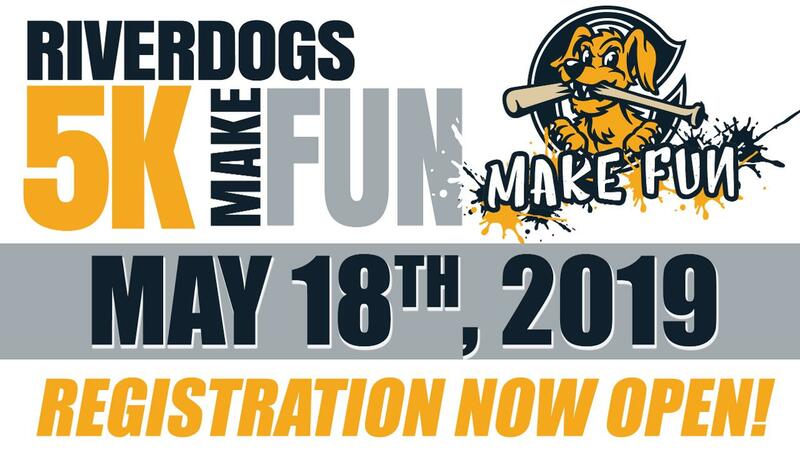 Registration is now open for this year's "Make Fun" themed race. Runners can pre-register now for one of the most unique race opportunities in the Lowcountry, featuring a 5K course around the park that culminates with a home plate finish at The Joe. Registration to the event includes a race bib, a "Make Fun" ball cap, post-race food and beer, and a ticket to that evening's game as the RiverDogs take on the Augusta GreenJackets at Riley Park. "We're excited to bring this year's 'Make Fun' theme to our annual 5K event," said RiverDogs Director of Special Events Lisa Dingman. "New and returning participants will find a great way to spend an afternoon followed by a ballgame." Fans can pre-register for the event for just $35 until May 5 and for $40 from May 6 until the day of the event. Registrant packet pick up will take place on Friday, May 17 at Fleet Feet Sports in Mt. Pleasant from 12 p.m. to 6 p.m. and on the day of the run from 2-3:30 at The Joe. The race begins at 4 p.m. with the first pitch of the evening's ballgame scheduled for 6:05. Registration is open at rileyparkevents.com.